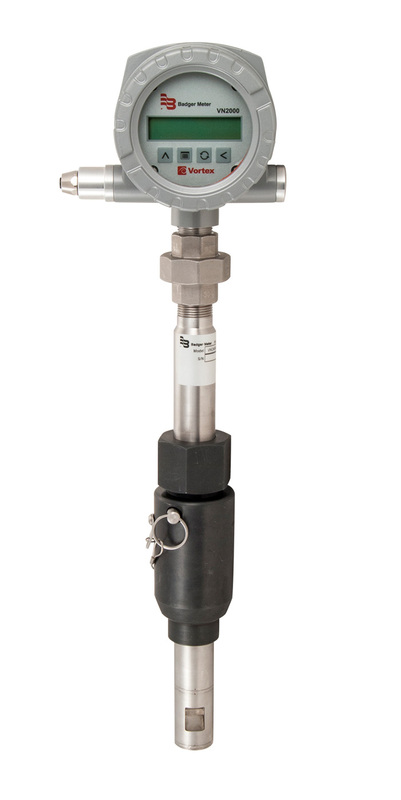 The VN2000 Compact Direct Insertion Vortex Flow Meter measures the volumetric or mass flow rate of steam, gases or liquids over a large flow range. The meter is a heavy duty design engineered to stand up to the most abusive environments inside and outside the pipe. The meter includes a mounting assembly to simplify the installation and ensure proper installation depth and orientation for a specified pipe size. Additionally, the probe length is sized to match the pipe size to minimize the meter length. The VN2000 Compact Direct Insertion Vortex Flow Meter measures the volumetric or mass flow rate of steam, gases or liquids over a large flow range. The meter is a heavy duty design engineered to stand up to the most abusive environments inside and outside the pipe. The meter includes a mounting assembly to simplify the installation and ensure proper installation depth and orientation for a specified pipe size. After depressurizing the pipe and welding the mounting assembly on to the pipe, simply insert the VN2000 Compact meter into the mounting assembly and align the meter so the pin can be inserted into the mounting assembly. When the pin is inserted, you are ensured that the meter is inserted to the proper depth and is aligned with the flow. The pin also acts as a secondary method to prevent the meter from coming out of the pipe once the pipe is pressurized. A small dummy probe without a transmitter is used to temporarily plug while a Compact Insertion Meter is out of service. A secondary insertion RTD is used in conjunction with an RTD internal to the probe to measure the temperature difference across a heat exchanger. The energy transfer can be calculated by multiplying the temperature difference with the mass flow rate.